Rob Hirst, Midnight Oil’s inspiring drummer/songwriter/singer, gives Lee Harte a first-class education in music and politics, and hints at new tunes on the horizon. Australian Times’ Lee Harte spent hundreds hours beating drums and bashing ear drums to Midnight Oil’s Scream in Blue. We thought it only fair he bends Midnight Oil drummer, Rob Hirst’s ears on the eve of their summer European tour. which includes gigs at the O2 Apollo in Manchester on 9 June and the O2 Brixton Academy in London on 13 June. A self-confessed luddite and late-onset bird watcher, currently Rob might be found in his little wooden fishing boat on Sydney harbour in warmer climes. Meanwhile, I’m freezing my nuts off on a two- degree bike commute to work in London. “Well, there’s major drought happening here,” says Rob chatting to me on the phone from Oz. Rob cites a combination of drought and climate change. “I have had the misfortune yes,” he laughs. So, you think Pete would be up for a dance off? Nearly 30 years ago, Midnight Oil famously played in New York on the back of a flatbed truck in protest at a giant oil spill in Alaska. I wonder if there’s any chance of them doing that again in light of the UK’s current parliamentary mess that continues to dirty its political waters? So back to what they do best, the band toured Great Circle in 2017, including a stint in the UK, with great gusto, breaking their fifteen-year hiatus. What goes on backstage is much the same as way back in 1981, but with more limbering up for Rob and Pete [Garrett] who have the more exhaustive physical act to bring to stage. “It’s definitely not Motley Crew, ha! I drink lots of water and a bit of dark chocolate is about as wild as it gets,” Rob says. What’s their aural poison then? Rob enthuses it’s a really great time for Australian music. Although BBC 6 radio give Aussies quite a bit of airtime in the UK, Rob rightly suggests I might not be aware of the extent of the home-grown music scene. “You might not know this, but the number of indigenous bands have gone through the roof. Briggs and Trials’ hip hop album from last year just charted, and people like Baker Boy [Young Australian of the Year]…the charts are full of acts that have come out of the woodwork that are first class,” he enthuses. “A lot of it is rap and hip hop, but there’s some hard rockin’ bands as well. For aspiring drummers, even luddite Rob admits a great thing about Youtube is being able to see how great players actually play. “Go back and see the great drummers of early last century, see what the big band drummers were doing like Jo Jones. They were sensational,” he advises. “You can go back through the generations through Keith Moon, to Gene Krupa and the surf beat drummers. It’s endlessly fascinating. “My daughter Gabriela lives here in London so that’s what I look forward to coming to England. ” he says. Who knew the words foodies and road crews would go together? “Well, I know the road crew eat really well at nice restaurants on a day off, which makes up for the truck stops in the middle of the night,” says Rob. Bring on the Change – new music? And guess what: a bit of studio time has kicked things off for Midnight Oil pre-tour. “We’ve just done a block of four weeks recording demos, so somewhere down the track there will be some new music which is really exciting. Will audiences this tour be treated to a glimpse of the new stuff? So put your phones away, folks! 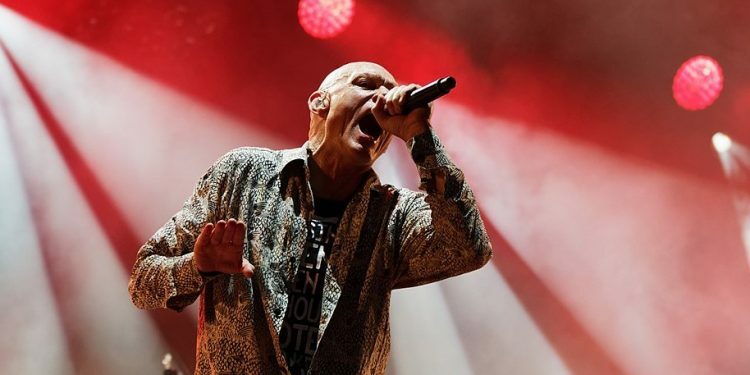 Make like it’s 1981 and maybe, you never know, you might even be treated to a taste of some spicy new sounds from a rejuvenated and energised Midnight Oil.